Patrick Smith primarily litigates toxic tort cases for Balick & Balick’s Asbestos group. 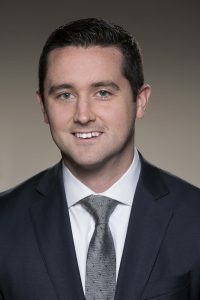 Prior to joining the firm, Patrick worked in the Delaware Attorney General’s Office, prosecuting crimes in the New Castle County Trial Unit. His years of public service have shaped his strong advocacy for victims in the state of Delaware. Our clients in the toxic tort realm are similarly victimized, and Patrick’s experience has positioned him well to represent their interests. Patrick has also given presentations for the Fundamentals of Criminal Law, Continuing Legal Education Seminar. Patrick graduated from Widener University School of Law, participating annually in the Martin Luther King Semester of Service Project. His honors at Widener include the Certificate of Achievement in Deconstructing the Expert Witness, given to the highest grading student in the class. Prior to law school, Patrick attended Towson University in Baltimore, MD where he was awarded the Annual Provost Scholarship for academic achievement.